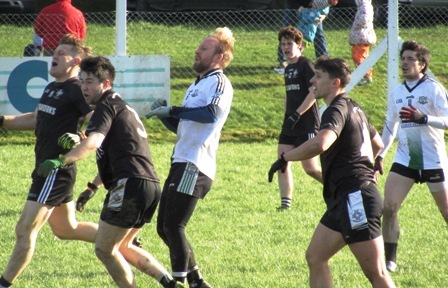 Walterstown played host to newly promoted senior team Longwood on Sunday last. Walterstown were hoping for a second victory in their campaign having beaten Black Hall Gaels last week. Longwood got off to the better start with a point in the first minute which was cancelled out minutes later by a fine Colm Reilly point. In the 5th minute however Walterstown were shocked by a Longwood goal after a quick moving series of passes. They then slowly clawed their way back into the game and helped by a John Geoghegan goal were 2 points ahead, when Referee Richard Morris blew for half time, on a scoreline of 1-5 to 1-3. Whatever Walterstown manager Joe Treanor and mentor Martin O Connell said to their team at half time seems to have really boosted the players’ morale. They started the second half with a scoring blitz in the first 7 minutes, consisting of 1-6 which included a well taken Sam McCabe goal. The scoreboard now read 2-11 to 1-3 in favour of Walterstown. Longwood then regained their composure to score another goal. All hopes for a Longwood comeback however were ended as the home team continued to clock up the scores. When substitute Conor Lenehan scored the Blacks 3rd goal, the game was effectively over as a contest. At full time Walterstown had scored an impressive 3-17 to Longwood’s 2-6.